Terracotta Warrior trip was fascinating - amazing how all these figures were buried underground and not found until 1974! The archaelogists have done a great restoration job. After a 15 hour overnight train, we arrived in Suzhou and explored the pretty canals and gardens there. We have now arrived in Shanghai, which is a huge city with an impressive skyline. We have seen the Shanghai acrobats, been to the markets and eaten more yummy food (although not sure we would include duck tongue and sea snail in this description!). 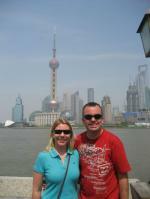 Last night in Shanghai tonight before we fly to Kunming in the South West of China.